1 We live in challenging but hopeful times. All political parties struggle to communicate a convincing vision. People feel detached from politics. Alongside a healthy openness to new ideas, worrying and unfamiliar trends are appearing in our national life. There is a growing appetite to exploit grievances, find scapegoats and create barriers between people and nations. The issues around the election call for a fresh moral vision of the kind of country we want to be. There is no doubting the sociological truths which underpin these observations. But the most profound (and wholly justified) criticisms are ones that will not and cannot be addressed by a change from a Conservative-led coalition to a Labour administration (or back again). A shift from right to left will not dispel doubt, negate cynicism or nullify apathy. What are these ‘worrying and unfamiliar trends’? They don’t say. Do they mean racism? The far right? Ukip? A “fresh moral vision” requires a far more fundamental reformation of the body politic and renewal of national life. So, from the outset, the Bishops’ Letter is over-ambitious in its aspirations and reach. Further, everything that the Bishops observe about the perishing state of politics, the politicians could surely retort with a critique of the decrepit state of true religion. The Bishops berate the political parties over their “struggle to communicate a convincing vision”, while the Church of England is itself declining, aging, and failing to articulate a vision. Lord Carey has prophesied that the Church of England will be extinct within a generation. This is the Church’s primary challenge: ‘For if the trumpet give an uncertain sound, who shall prepare himself to the battle?‘ (1Cor 14:8). Yet what should the Church’s message be? What is the point of proclaiming Christ and Him crucified for our sin and salvation, if that Christ be another unknown god; the concept of ‘sin’ meaningless, and ‘salvation’ devoid of definition? ‘But we preach Christ crucified, unto the Jews a stumbling block, and unto the Greeks foolishness‘ (1Cor 1:23). Can the language of applied theology speak to an unbelieving cynical people? Is this Letter a stumbling block to the people and parishes of the Church of England? Is it foolishness to the Tories? And what of the assertion that “people feel detached from politics’? Some may be, certainly. But the referendum on Scottish independence (and the phenomenal growth of the SNP since) establishes that people form a distinct attachment to politics when the vision inspires. Without one, they perish. People may certainly feel frustrated or disappointed with Parliament, but they have never had greater access to politicians than modern technology affords. The Bishops are right to highlight the lack of top level vision (and it is no coincidence that they later reference Thatcher and Attlee – the two conviction politicians who fundamentally transformed the country in the last century). But it will take a similarly unique (and undoubtedly divisive) politician to do this in the future. Political vision isolates and segregates: the bland uniformity and tedious incrementalism of ‘Red Tory’ and ‘Blue Labour’ is perhaps what is exacerbating feelings of detachment. And what of the overarching corpus of EU legislation? How does a farmer’s vote change agricultural policy? How does a fisherman’s vote amend trawling restrictions? Feelings of impotence are caused by the anti-democratic polity foisted upon us, which leads to the very detachment which constrains participation. These are not being addressed in the coming General Election, so the Bishops should be more realistic about what can be done. People can only vote for the candidates and manifestos in front of them. 2 Followers of Jesus Christ believe that every human being is created in the image of God. But we are not made in isolation. We belong together in a creation which should be cherished and not simply used and consumed. This is the starting point for the Church of England’s engagement with society, the nation and the world. All that we say here follows from this. Anglicans do not have a single view on which political party has the best mix of answers to today’s problems. As bishops we support policies which respect the natural environment, enhance human dignity and honour the image of God in our neighbour. It is undoubtedly true that “Anglicans do not have a single view on which political party has the best mix of answers to today’s problems”, but the Bishops incline toward a vision of society that professes “the best mix of answers”: we usually get them via the Guardian (or the Sunday Mirror). And their professed neutrality is impaired ever so slightly by their declared overarching policy interests, which are (in this order): the environment; human dignity, and neighbourliness. These are most often reified in contemporary culture as global warming, human rights and equality – the perceived priorities of the left. 3 The General Election on 7 May 2015 is the first for which the date has been set so long in advance. We have an unprecedented opportunity to think through the issues that face the nation and to ensure that the concerns and insights of the Christian gospel are reflected in the debates that will help shape the outcome. This letter is intended to help church members and others consider the question: how can we negotiate these dangerous times to build the kind of society which many people say they want but which is not yet being expressed in the vision of any of the parties? This is where the Letter fails, as it is unable to expound a clear new vision “to build the kind of society which many people say they want”. If asked to summarise the Letter’s vision in one sentence, would it be possible? This inability feeds into the major issues that the Letter is right to raise – the value assigned to individuals in a market-based economy; the change in societal values from communal to individual preferences, etc – but unable to answer. What exactly are the Bishops advocating beyond participation? How do they envision the common good? Where is the moral guidance? These are complex and profound matters which cannot be (and so are not) addressed in an election manifesto. Until someone comes up with a new economic model that replaces capitalism, we have to work with the least worst system (to borrow Churchill’s words). 4 We are suggesting the trajectory for a new kind of politics – one which works constructively with a ferment of different ideas and competing visions. Although we have numerous specific concerns about particular issues in national life today – and will no doubt be developing those ideas in other places – here we want to move beyond flagging up lists of issues to dig deeper into questions about the trajectory of our political life and visions of the kind of society we want to be and which political life should serve. If anyone claims that this letter is “really” saying “Vote for this party or that party”, they have misunderstood it. The final line is straight from the mouth of the Archbishop of York: they were his precise words at the launch of his book On Rock or Sand?, at which he was clearly irked that anyone could be so utterly dense as to think his thesis was in any sense partisan. The fact that “the theology of where I am coming from” was contingent on Marx is irrelevant. The fact that his book included chapters by a prominent Labour peer and intellectuals with known left-leaning proclivities is of no consequence to him (or other bishops, for that matter). Simply stating that this Letter is not “really” saying “Vote for this party or that party” does not mean that it is not influencing people’s thoughts and decisions in a particular direction. Certainly, to quote Karl Marx is not to say ‘Vote Labour”, but to do so is manifestly to disclose the philosophical foundation of the preferred “trajectory for a new kind of politics” (which isn’t new at all). The selection of primary issues is contentious for those on the right – the environment, nuclear armament, the European Union – and these areas of messaging belie the patronising assertion that those who detect a partisan undercurrent “have misunderstood it”. If the Bishops had mentioned (say) national sovereignty, statehood, marriage, the family or abortion, we may perceive a true fermentation of different ideas. But perhaps we can’t say that, for fear of being told we’re basically dull in our understanding (Mt 15:16). 5 The privileges of living in a democracy mean that we should use our votes thoughtfully, prayerfully, and with the good of others in mind, not just our own interests. Pursuing the common good is a Christian obligation and is expressed in how we approach our role as voters as much as in our personal priorities. Absolutely. 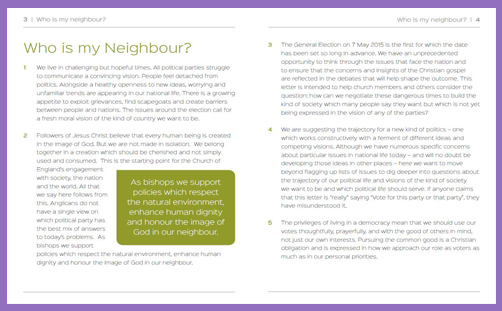 Yet one is left wondering how many bishops will prayerfully consider – thoughtfully, prayerfully (and truthfully) – that a Conservative government (or a Conservative-led coalition with Ukip) may be best for the country and represent the most Christian pursuit of the common good. But we can’t ask that, can we? Even to hint at it is to misunderstand the Letter. The dialogue continues..